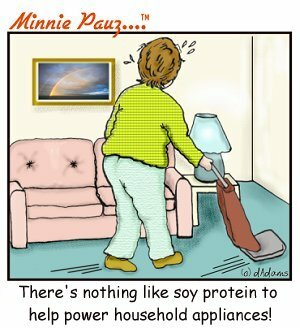 minniepauz.com - The JOY of Soy? You are here: Home // Reading The Minnie Pauz Blog // The JOY of Soy? "Beans, beans..good for the heart..."
Sometimes we'll try just about anything to get relief from what ails us! In this day and age, there seem to be too many choices. I wish there was a "menopause pill", but no, it could never be that simple! This is where your imagination comes into play! Hot flashes seems to be the most aggravating symptom for the majority of women I talk to on the message boards and in the emails I receive. I'm so glad I work at home because I can get down to bare skin if need be! I'm careful to avoid mirrors though, because THAT brings on a severe panic attack! I kept reading how soy supplements were helping eliminate hot flashes, so after much research, I ordered some online. Two days later I had my samples and after reading about all the other health benefits to be gained from soy, I was ready for it! I mixed my self a soy shake that was so good, I decided to have another! In my mind, I was thinking, "no more hot flashes, my cholesterol will go down, I'll lose weight, lower my risk for heart disease....". I had a real sense of well-being for the rest of the morning. At lunchtime I decided to try one of the soy nutritional bars that had come with my order. Hey, not bad! It was CHOCOLATE! After seeing how good it was, I just HAD to try the vanilla flavor! Also very tasty. I felt full, so there was no need to have anything else for lunch. I started a pot of chili and let it simmer for the rest of the afternoon, thinking what better meal for such a wintery Michigan day! Then I went happily back to work on my computer. Around 6 pm, I took a break and ate a pretty large bowl of the chili with crackers and a glass of cold milk, just the way I like it! Those of you who are familiar with taking soy know exactly what I'm getting at. I had the most miserable night of my life! At first it was funny, although I was grateful that I'm single and no one was around to hear what was going on! Then it became very painful and I made twice as many trips to the bathroom than normal. I was up and down all night long and looked like death warmed over when I saw my neighbor the next day. I definitely had one of those "Minnie Moments" when she reminded me that soy products come from soy BEANS! The product information recommended 1 serving per day and I had consumed 4 servings, plus my delicious home-made chili (with beans, of course).